It seams to me that "On Last iteration" feature available in a page configuration doesn't work at all. I mark last page (in my case - logout) with this property and it is still run on every iteration. I'm using Version 2.5.4743 beta. Thanks for reporting the issue with "On Last iteration". Will double check and let you know the status. then pages marked "On Last iteration" (eg. 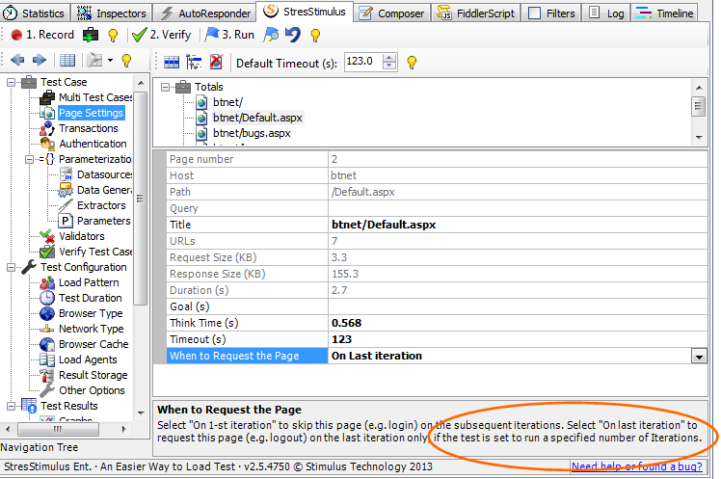 log-off), run once, as specified in the application help. 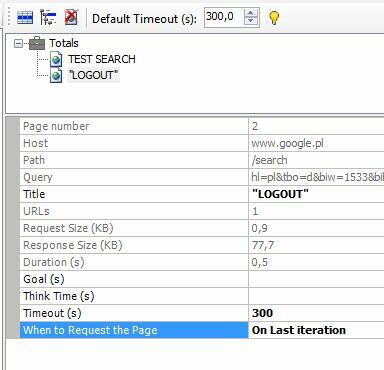 However, when "Test Duration" is set to "Run Duration", then the log-off pages do not run at all, since StresStimulus completes the test after certain time elapsed and does not have a chance to run logoff pages for every user. I was unable to replicate the behavior when the log-off runs on every iteration, as you described. Please let me know if you still see this issue and I will investigate further. ssconfig file that you attached does not have enough information for us to troubleshoot. Would it be possible for you to upload your test case to our support secure repository? To do so, in StresStimulus main menu -> "support options", select " upload support case". 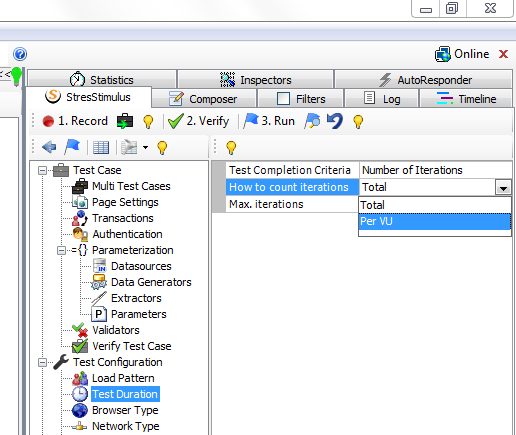 Got it and found the issue with the test configuration. For "On Last iteration" to work correctly, the "Number of iterations" settings should be set "per VU". So, instead of setting 80 combined iterations for two VUs, set 40 iterations per VU. In the first case, the 80 iterations will be divided between users not necessarily evenly, because the faster VU will run more iterations. As a consequence of this, StresStimulus cannot determine the last iteration for each VU. In the next release will add a warning to guide users to a correct configuration.